Your Next Stamp New Release Preview! Hello! Are you ready for some new Your Next Stamp goodies? We have a few previews to share with you today, and all of the new products will be available tonight at 10pm EST! To see the full list of blogs that have a preview, head over to the YNS Blog! 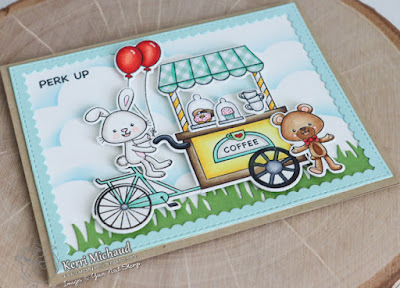 For my card today, I used the adorable new Coffee Cart stamp set! This set is so perfect for creating a fun little scene, and isn't that cart just the cutest? I paper pieced the awning of the cart with some dp from the Hugs and Kisses 6x6 Paper Pack. I colored the rest of the images with Copic Markers and cut them all out with the coordinating Coffee Cart Dies. To create my scene, I sponged a cloudy sky and added some grass cut with the YNS Stitched Grass Die. I'll be back later for the YNS New Release Blog Hop which starts at 10pm EST! We hope you'll join us! Thanks for stopping by! It so cute! I wish carts like this came to my house instead of ice cream trucks! 3 cheers for the coffee cart!!! so darn sweet and cute!!! love it!!! This is adorable! I love the coffee cart! Great coloring! This beautiful, beautiful PERK UP card is so airy and light. If the grass wasn't there to ground the cart, I sure wouldn't mind it. There ARE balloons to carry it away. Love, love, love it.